Most old mud loggers will tell you that there is no official definition of a unit of gas. If that is the case then why do mud loggers, geologists, and other oilfield personnel talk about gas in units. The reason is that units of gas are indeed defined in the oilfield. They are defined by tradition, by mud logging companies, and by oil and gas exploration companies. In my experience, only two standards for calibrating mud logging gas detectors exist in the United States. Both of these standards define gas units that are equal to a known concentration of methane in air. The first standard is: one percent methane in air (or nitrogen) is equal to 50 units of gas. The second standard is: one percent methane in air (or nitrogen) is equal to 100 units of gas. I would also put forward that the 100 unit standard is by far the most common. Also, in my experience, the determination on whether to use the 50 unit or 100 unit standard is almost always determined by one of three factors; geography, preference of the oil company drilling a well, or the preference of the mud logging company contracted to handle the mud logging service for a particular well. Geography is a big one because in my experience the 50 unit standard is almost exclusively used either off shore in the Gulf of Mexico, or in South Texas. The 100 unit standard is used almost everywhere else, at least in the United States. If the oil company has a preference it is almost always the 100 unit standard. This is because most oil companies prefer higher gas readings to lower gas readings when given the choice. Mud logging companies usually have their own preferences, but most will defer to oil companies on the matter. I would also add that whether the 50 unit or 100 unit standard is used, the gas curve will look exactly the same on a linear scaled gas column on a mud log and only slightly different on a logarithmic scaled mud log. The differences on the logarithmic scaled mud log will be more pronounced with lower gas readings. All of that being said there is still no official definition of a unit of gas; at least not one that I am aware of. Recently, I was brushing up on search engine optimization for the Geospect website and noticed that some search engines still have different results for the terms "mudlogging" and "mud logging." Thank God Google recognized these two terms as being one in the same many years ago, however, some search engines treat the two terms as different terms. "Mudlogging" and "Mud Logging" both mean exactly the same thing, so why don't the search engines do something about fixing it. I assume they have either not been made aware of the issue or that they do not have the resources to follow up on it. They could probably care less. It is more than likely a combination of all three. It also seems that if the various search engines fixed "mudlogging" and "mud logging" that they would also have to worry about fixing the various other forms of the word such as "mud logger / mudlogger" and "mud log / mudlog." I know this seems like a petty issue, but when SEO is involved one must account for the different ways to write the same keywords. Perhaps they should group new terminology in as well. The term "Surface Logging" comes to mind. In fifty years maybe someone could write an article about "surface logging" vs "surfacelogging." Well there's my rant for tonight. A geolograph is a device that measures depth and that if installed is usually found in the doghouse. It was once commonplace for a drilling rig to have a geolograph while on location drilling an oil or gas well. Mudloggers would connect a micro-switch, donut, or similar device to the rig geolograph in order to get a depth signal for their mudlogging instruments. 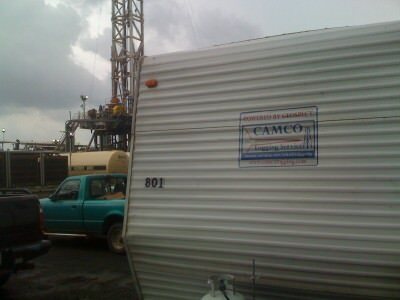 Now days it is more common for the rig to get its depth from a computer system hooked to an optical encoder that is mounted onto the drilling rigs draw works. If the mudlogging company has the technology to connect to the rig computer, mudloggers can simple get a WITS connection from the EDR company and receive their depth digitally. This presents a problem if the mudlogging company doesn't have WITS technology. If that be the case, what is the mudlogging company to do? One solution would be to purchase a Geospect mudlogging system. Geospect is a complete mudlogging system in a box. This is the ideal solution since it comes with the ability to connect to either WITS or the older "pulse" systems. Geospect is quite affordable but it might still be out of reach for a brand new or fledgling mudlogging company. What if the new mudlogging company has already purchased some older instruments that can't communicate with the rig computer via WITS? 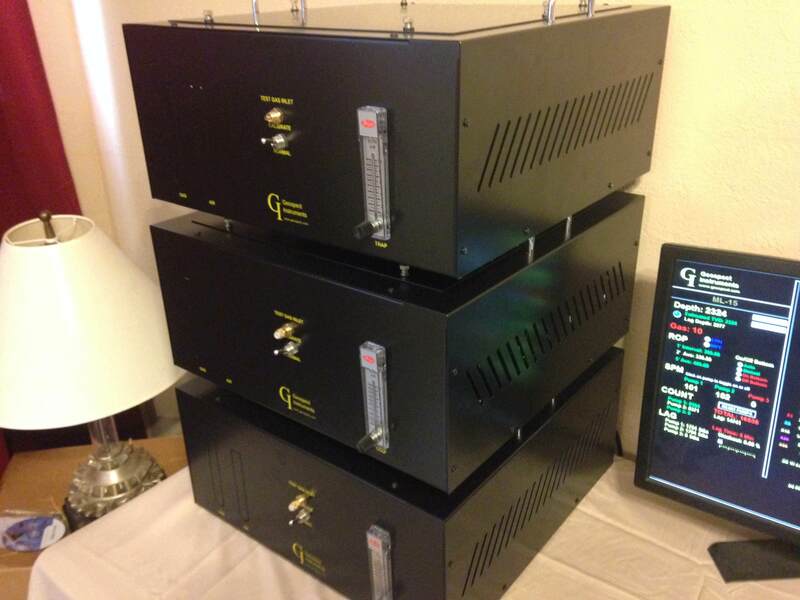 Geospect makes a DAQ system that hooks up to most third party instruments. It can also communicate with rig computers for a fraction of the cost of renting equipment or purchasing new equipment. For more information visit the Geospect Product Page. This is the story about how we came up with a low cost high speed oil detector. 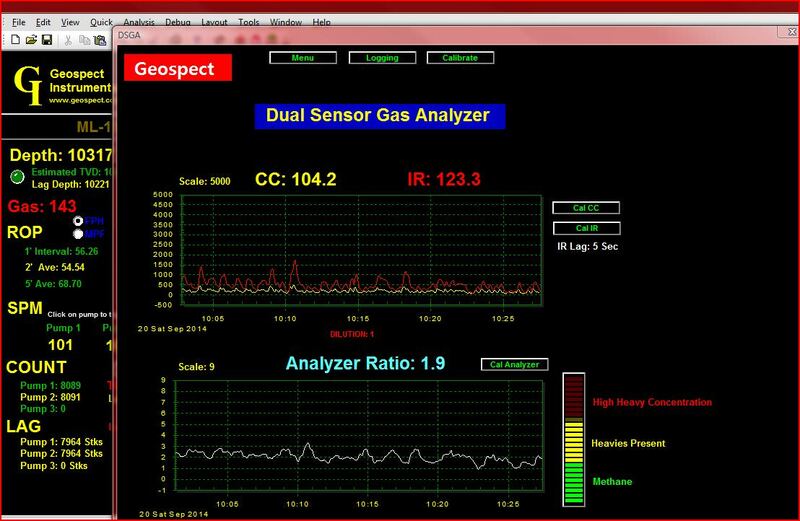 The Dual Sensor Gas Analyzer by Geospect. Mud logger's are the folks that do the work of trying to find oil and gas bearing zones while a well is being drilled. Mud logging has been around since 1939 and first consisted of a basic gas sniffer. Over the years the a few more technologies have been added to mudlogging. One of those technologies, the gas chromatograph, was added sometimes during the 1950's. The chromatograph complimented the basic gas sniffer or gas detector as it is commonly referred to. The chromatograph allowed the mudlogger to not only know that he was getting gas while drilling through potentially productive zones, but it also allowed him to break the gas down into its component gases. The longer it took the sample of gas to come out of the chromatograph column, the heavier the gas was deemed to be. Methane came out first because it had fewer hydrogen and carbon atoms. Methane was considered a light gas. Then if heavier gases were present they came out next in order from lightest to heaviest. Ethane came out immediately after methane, then propane, iso-butane, and normal butane respectively. That basically meant that the mudlogger could determine by reading his instruments whether the gas he saw contained oil or if it primarily contained natural gas. If heavies, which was any gas heavier than methane was present then the mudlogger quickly began looking for other signs of oil such as fluorescence or oil visible on the mud pits. As one could imagine the gas chromatograph was, and still is, a critical tool for determining if an oil bearing formation is being drilled through. As critical as the gas chromatograph is for gas analysis on a mudlogging unit, it isn't perfect. One of the main problems with a chromatograph is that it is too slow for modern drilling. Drilling technology has increased dramatically in the last few years. 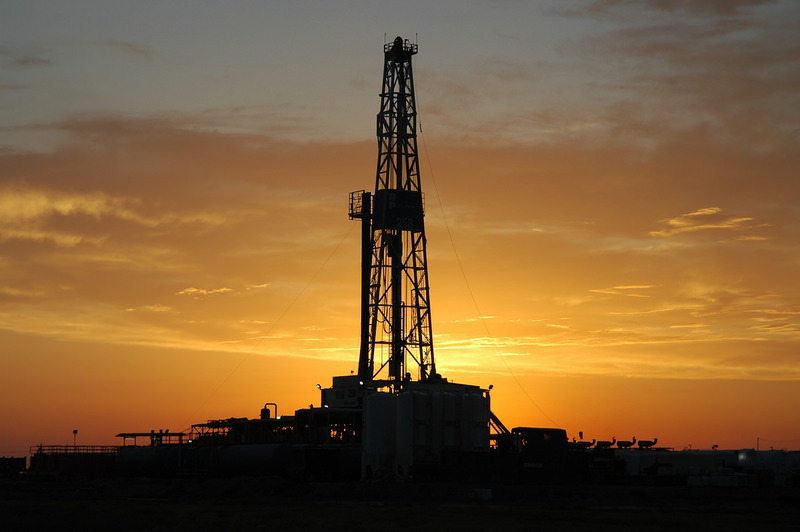 Wells are now being drilled faster and more efficiently than ever before. A typical mudlogging chromatograph takes five minute to analyze a sample of gas before it can take another sample. The possibility exists that entire oil bearing zones can be missed because the chromatograph was too slow to keep up with fast drilling.There are faster chromatographs, but with faster speeds, relability typically suffers and cost increases significantly. The basic gas detector that was used in 1939 incorporated a hotwire sensor, also known as a catalytic combustion sensor, in conjunction with a Wheatstone Bridge circuit. A coiled platinum wire was heated until it glowed. Gas from the well was pumped over the platinum wire. The more gas that came into contact with the wire the hotter it got. Since the platinum wire changed its electrical resistance in direct proportion to its temperature the mud logger was able to output his results to a chart recorder, thus plotting a curve of the gas present. The detectors response to all of the various hydrocarbons was fairly linear in relation to on another. The hotwire detector is still being used in today's mudlogging units and is widely accepted as a good method of detecting gas. Recent breakthroughs in infrared gas detection sensors has made the infrared detector a popular choice for the modern mud logging unit. Modern infrared sensors are extremely stable and sensitive to even minute traces of gas. They are capable of detecting from 0% to 100% gas in air without additional calibration. They are an excellent choice for total gas detection on drilling rigs. The infrared detector, however, is not without its issues. One drawback of the infrared detector is that it is not particularly linear across the spectrum of hydrocarbon gases that it detects. For example, if the infrared detector is calibrated so that 100 units is equal to 1% methane in air it will read three times that many units when exposed to 1% propane in air. While it is still acceptable because we are only measuring relative quantities of gas, it is sometimes difficult to explain to our oil company bosses how we can read 300% gas in air during high gas situations. Here at Geospect Instruments, we have been building both hotwire and infrared mud logging gas detectors for many years. For years we were bombarded with requests for a faster more reliable chromatograph and also questions about higher than normal gas readings while drilling through heavies with an infrared detector. We finally realized that the answer to both issues was sitting right under our noses the whole time. We discovered that by placing a hotwire sensor and an infrared sensor in the same gas detector that we could detect heavy hydorcarbons in real time without even needing a chromatograph. Basically, we invented a low cost, high speed oil detector. We call our invention the Dual Sensor Gas Analyzer. We are very excited about our new mudlogging gadget and hope you will be too. The Geospect continuous mud logging chromatograph detects methane through n-butane in under two and a half minutes. It fits neatly into the Geospect mudlogging system's case. The Geospect gas chromatograph uses the "packed column" method to break out hydrocarbons. The chromatograph also uses air as carrier its carrier gas. First, gas from the well bore is pushed through the column with approximately five psi of air. When the gas exits the column it is runs across a catalytic bead sensor and produces peaks. The gases come out in the following order: methane, ethane, propane, iso-butane, and normal butane. The peaks are then analyzed by the Geospect software and recorded. The above described process continuously repeats itself. Geospect, LLC. is in the business of designing state-of-the-art gas detectors for the mud logging and drilling industries. Our gas detectors are fully computerized. The Geospect mudlogging software will display a continuous lag depth along with total gas readings that are produced by the Geospect Gas Detector. Currently, Geospect Instruments manufactures three mudlogging gas detectors. The catalytic combustion detector, frequently referred to as the "Hotwire" gas detector, the Infrared mud logging gas detector, and our newest detector; The dual sensor gas analyzer. The Geospect Catalytic Combustion Gas detector (ML 18CC), commonly referred to as the "Hotwire" detector, uses a catalytic bead sensor that changes electrical resistance when exposed to hydrocarbons. The Geospect gas detection system then converts the electrical signals to digital data that are displayed in our software. The Geospect Catalytic Combustion Gas detector (ML 18IR) utilizes an infrared sensor that is tuned to the area of the infrared spectrum that is absorbed by hydrocarbons. Infrared sensors have a light source, a filter, and a sensor. The filter filters all of the light except for the infrared spectra in the hydrocarbon range. As hydrocarbon gas passes over the sensor some of the infrared light is absorbed. The sensor the detects the amount of light remaining after said absorption. The Geospect instrument then converts those differences in infrared light intensity to electrical signals, and finally to digital gas readings. Over the years of developing mud logging gas detectors, we have discovered differences in the way that hotwire, and infrared detectors read gas. 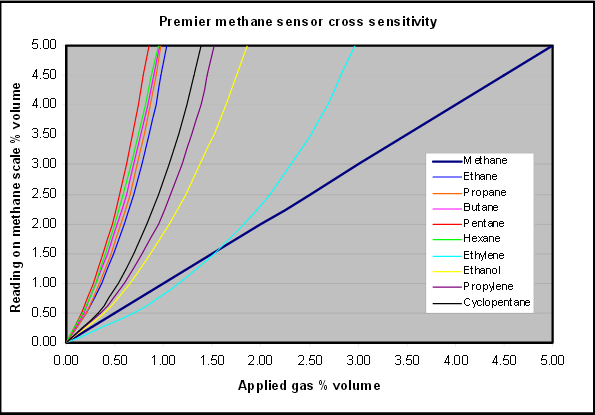 The most noticeable difference is when the hydrocarbon gas stream entering the detector contains only methane, or whether it also comprises heavier hydrocarbons like ethane, propane, butane, and pentane. The heavier gases cause both gas detectors to read higher than they would if exposed only to methane. The difference is that the hotwire detector reads only slighter higher when exposed to "heavies" whereas the infrared detector readings are much more pronounced when exposed to heavies. For example, when the IR detector is exposed to 1% by volume of propane it will read higher by a factor of three than it would if exposed to the same amount of methane. Therefore if the instrument is calibrated with 1% methane in air to read 100 units, it will read 300 units when exposed to 1% propane in air. We at Geospect, after talking with some of our customers, have discovered that if both sensors are included in the gas detector that the differences in the sensor readings can be used to determine is heavies are in the gas stream. This determination can be made in real time and independently of the mudlogging chromatograph. In 2018, drilling rates are becoming faster and faster. It is of great benefit to oil companies to know the exact depth at which the heavies occurred. This is sometimes impossible to do with a standard mudlogging chromatograph, because of analysis time. Most dependable mudlogging chromatographs only take a one second sample every five minutes. That resolution is not good enough for today's fast drilling environment. The dual sensor gas analyzer should be included on every mud logging job so that the depth that heavies have occurred can be determined more precisely than ever before. Geospect software is the nerve center of the Geospect mudlogging system. Its menu driven screens are as powerful as they are user friendly. It is WITS compatible and is capable of both sending and receiving data to other WITS enabled computers across the wellsite. 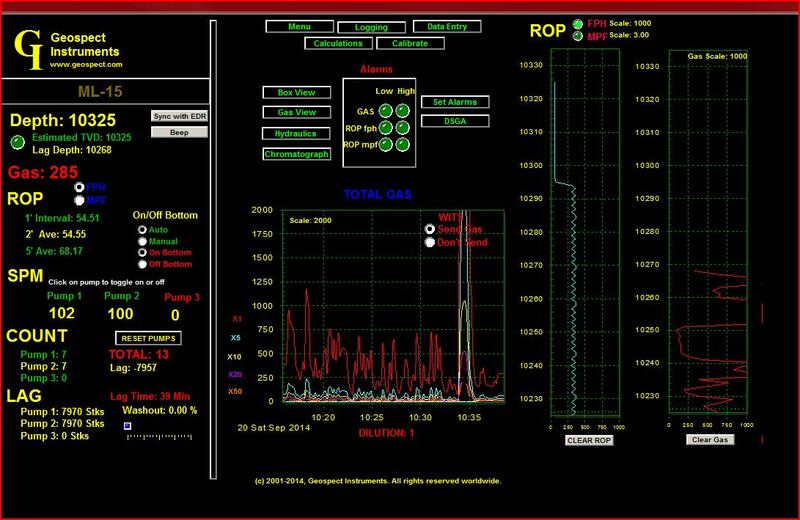 DISPLAYS -It displays a rich, robust picture of critical mudlogging data in real time. 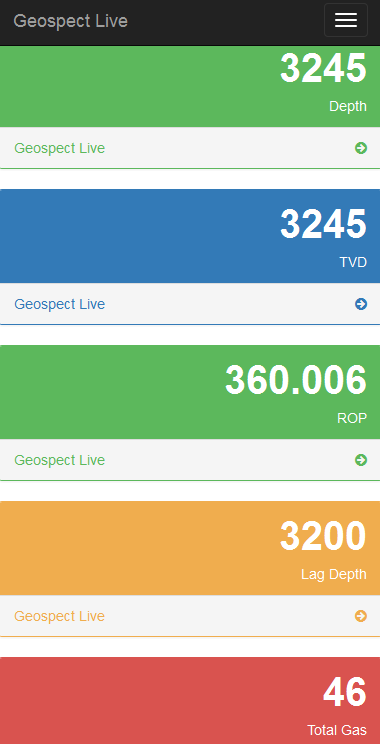 CALCULATES - It also does many mudlogging calculations in real time; such as lag, rate-of-penetration, and TVD. 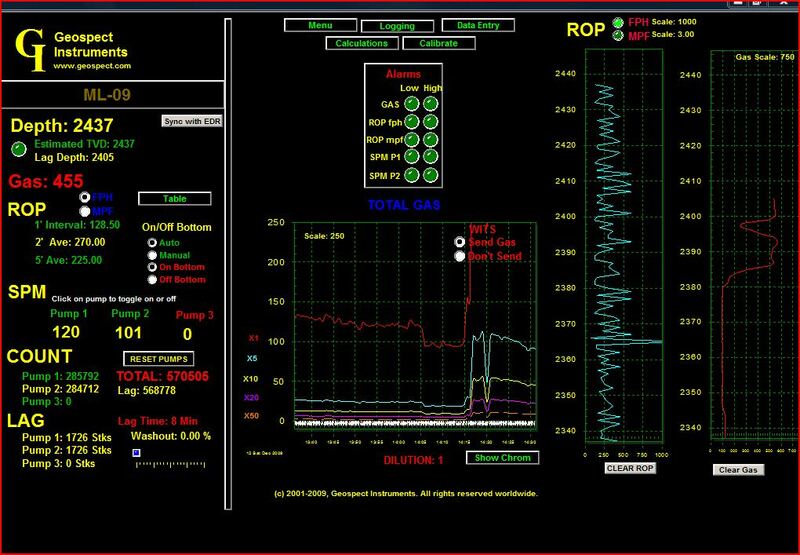 LOGS - Geospect software logs all relevant mudlogging data into spreadsheet format; such as ROP, Lagged Gas, Chromatograph Readings, Co2 Data (if applicable), and TVD. Geospect can log data based on depth, time, or both. ALARMS - There are many alarms that are accessible through Geospect software. 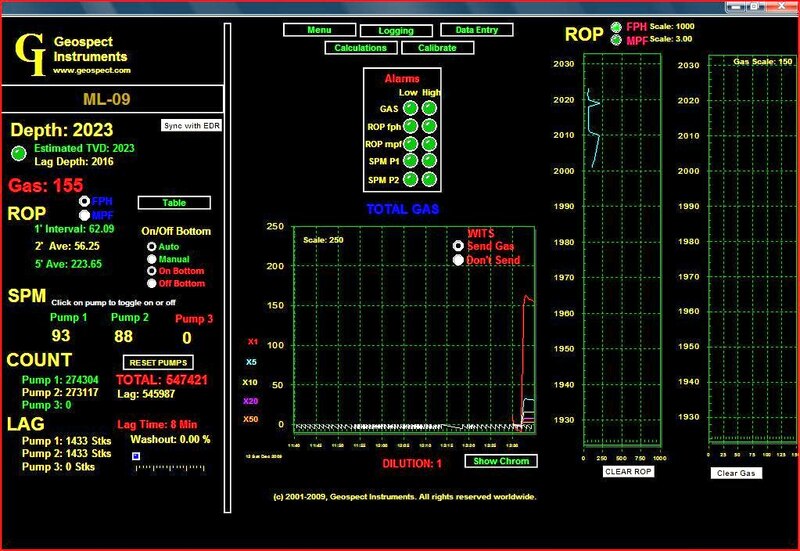 Alarms include both high and low settings for: ROP, Gas, SPM, etc. Alarms are both visible and audible. PULSE - Just because Geospect is capable of getting its data from WITS doesn't mean it has to. Geospect supports traditional sensors as well. Yes, you can still hook up micro-switches, donuts, depth wheels, pump stroke counters, on/off bottom switches, etc to Geospect. Make an inventory checklist for everything that must go in your mudlogging unit. Have whoever is stocking the unit initial by each item when it is placed on the unit. This is very important because if something is left behind an extra trip might have to be made to take something out to the location which could be hundreds of miles away from the shop. It is also a good idea to have the unit manager initial that the items were received out in the field. Make a checklist of all of the equipment that is leaving out to make sure it is in good working order. Have the technician initial by each piece of equipment that it was working properly when checked. Make a checklist of everything on the trailer and make sure it is safe and legal to be on the road. Rig up day can be frustrating for some mudloggers. Sometimes they drive for hours to get to a muddy location. After arriving they sometimes must immediately rig up. This often leaves no time for grocery shopping. It is also better to go grocery shopping after rigging up because then the refrigerator is on and working at that time. Stocking the unit with canned food and snacks for rig up day often makes things run a lot smoother. Following these simple tips can save time, money, and aggravation. Geospect owner Mike Cunningham, Jr. has been mudlogging since he was 10 years old. Mike would help out at his father’s mudlogging company after school and during summer vacations, “catching samples” and learning about the business. By the time he was 19, Mike was in operations at a large mudlogging company. By 1998, he had started his own mudlogging company, Camco Logging Service. The surprising thing about Mike’s experience is not how long he’s been in the mudlogging business, but how little the business has changed since he first became a part of it. Very little seems to have changed in logging during the past 30 years. While other industries have been revolutionized by the computer age, mudlogging has remained mired in the past. When Mike Cunningham opened Camco for business fifteen years ago, he envisioned a company that did things a little differently. Rather than using a hodgepodge of outdated equipment prone to frequent breakdowns, Mike envisioned a new type of instrumentation system. This system would be compact, accurate and easy to use. Even better, this system would be reliable, resulting in a dramatic reduction of downtime. Mike and the folks at Camco developed the Geospect Instrument over the course of five years. Years of field testing have resulted in the best mudlogging instrumentation system in the world, the Geospect. Through Camco, clients like Anadarko Petroleum, Kerr McGee, and Clayton Williams Energy have greatly benefited from Geospect’s superior performance. If you own a mudlogging company of your own, contact Geospect to find out how Geospect can benefit your clients. Contact us at (409) 771-3574, and we’ll be glad to talk with you about it.